Summer fruity flavours! Right here on this photo you can see just a few reasons why I love summer. Fresh, local strawberries and juicy mangoes! Something about summer that has you in a constant good mood and enjoying the fruits of the season. At our local market I bought a surplus of fruit and vegetables today and laying them out in my kitchen I could not help and smile at the wonderful colors and aroma. The mangoes were ripe and a rich aroma lifted up into the kitchen from the Queen of Fruits. The strawberries - luscious and red screamed at me to eat them NOW! I had bought so many that I did sit back and enjoy a big bowl. I was wondering how I should prepare these and thought of the most fantastic idea. 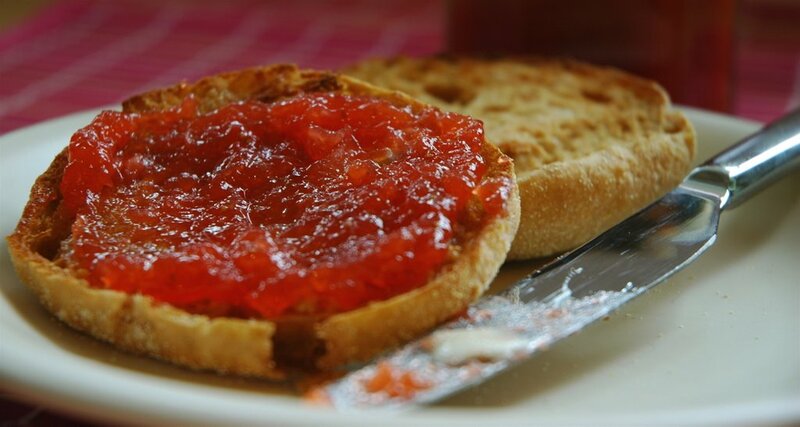 What about a tangy, fruity jam spread? I ran back into the kitchen and looked at the strawberries .... but the mangoes were shouting "me too, me too - Meeta!" Mangoes. Strawberries. Mangoes. Strawberries. I grabbed both and went to work. I added a few surprising ingredients as I went along. This is a versatile spread and can be used in so many ways. Fantastic when you can't be bothered to spend time in the kitchen when the temperatures are rising. 1500g strawberries and mangoes - coarsely chopped. You can choose the amounts according to taste I tried to go for a more mango -ier taste so put in a bit more mangoes. 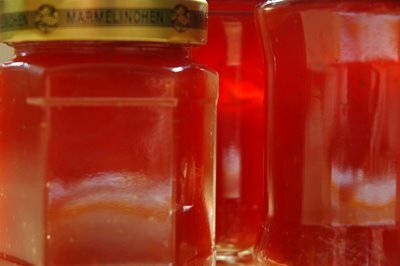 250g Sugar - In Germany we get special type of sugar especially for making preserves, jams and jellies which is what I used. I am sure normal sugar would be fine too. Add the chopped fruit into a large hot pot. Pour in the lime juice and cook gently for approx. 2-3 minutes. Puree the fruit using the puree machine. I like a few fruity bits in my preserves so I pureed the mixture roughly. Add the sugar and bring the entire mixture to a boil, constantly mixing it. Keep stirring for another 3 minutes. Add the ginger powder, lime zest. Fill into sterilized jars and seal the lid tightly shut with a twist off lid. Place the jars on the head for 5 minutes. Once cooled refrigerate. Scrumptious in the morning on toast and croissant, scrumptious in the afternoon on muffins and cake and certainly scrumptious in the evening with vanilla ice cream. Hey and not to mention scrumptious in between, blended into milkshakes! So you can now spend the summer on the terrace or balcony enjoying this spread in a variety of ways. I just hope you don't forget to cook! I will be taking a jar or two over to my in-laws tomorrow. Their verdict and Tom and Soeri's verdict after the weekend. Yes, I had some already and believe me this is a treat for your family. The combination of lime, ginger and the fruit is rich and aromatic. Would this not be a great treat for father's day brunch? I'm sure looking forward to finding out!! 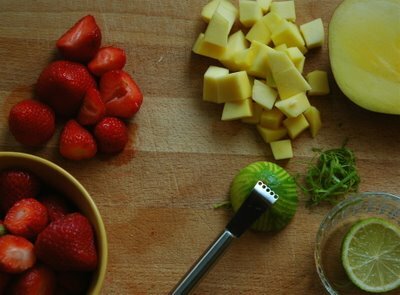 mango,strawberries,lemon zest-it's either salsa, or a crepe with fruit filling or jam?? What a lovely idea Meeta, thanks for another cracking recipe!! Exactly how much ginger powder would I need? And btw, what is the reason behind placing the jars on their heads for some time? Looking forward to your answers. mmmm...that jam looks so yummy...I recently tried my hand at jam making too..isn't it darned easy?!! I'm so hooked to it that even kiwi did not escape my hands...and it turned out good! Never tried my hand at jam making!Should start soon!The photos look so professional!Well Done Meeta! thank you all for the compliments and comments. Hope you don't mind being tagged for a meme? *sigh* Sounds really enticing, especially in this heat! I really like the color of this spread as well. Very creative, Meeta! Question: How long can you keep these in the fridge? I imagine that the lime juice will act as a preservative, no? Hey no kudos to me for guessing right??? SOb Sob!! The white background contrasts off your lovely pictures beautifully girl...and as usual you've done a great job- and I'm back to blogging after my trip and then falling sick after coming back! Pam, thanks for that one! Payal, ours never lasts long enough LOL! But in a lot of recipe books I read with these special twost off lids it can last for 6-9 months. Nandita, you're the only one who noticed the new blog design! Shammi, do tell me what you think! Looks interesting. A couple of questions, though: If it's vaccuum sealed, why do we need to refrigerate the jars? A properly sterilized and sealed jar shouldn't go bad for a very long time. Also, how many jars does this recipe make? I've only ever made jams using the insanely sugary recipes that Certo puts out (basically your recipe, but reversing the amounts of sugar and fruit), so I have no experience with this type of recipe. It'll be nice to have a jam that's more flavor than sweetness, for a change.